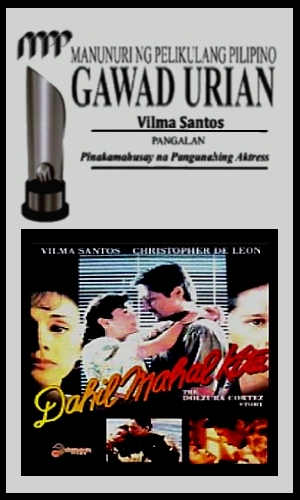 Film Achievements: 1993 Film Academy of the Philippines Best Actress – Vilma Santos; 1993 URIAN Best Actress – Vilma Santos; 1993 URIAN Best Music – Nonong Buencamino; 1993 STAR Best Actress – Vilma Santos; 1993 Manila Film Festival Best Actres – Vilma Santos; 1993 Movie Magazine Best Actress – Vilma Santos; 1993 Intrigue Magazine Reader’s Choice Best Actress – Vilma Santos; 1993 New Fame Magazine Reader’s Choice Best Actress – Vilma Santos; 1993 FAMAS Circle of Excellence -Vilma Santos; 1993 URIAN Best Director nomination – Laurice Guillen; 1993 URIAN Best Picture nomination – Octo Arts; Special screening – the 1994 San Francisco Asian-American International Film Festival; Special screening – the 1994 Amsterdam Film Festival. The “Dolzura Cortez Story” was the Philippines’ first movie on AIDS that provided ‘a name and a face’ among the 50 recorded lives that were lost to AIDS in 1992. This movie was utilized as a focus of discussion by some health care personnel to express their thoughts, opinions and recommendations regarding the use of cinema as a powerful tool for AIDS information dissemination. Responding to a newspaper advertisement looking for a person with AIDS, Ms. Dolzura Cortez agreed to have her life story serialized in print and later developed into a movie. The “Dolzura Cortez Story” was subsequently produced as the Philippines’ first movie on AIDS which documented the real experiences of a person living with AIDS in the country. The author reports findings from a study conducted to determine the social impact of the movie as perceived by some health care personnel. Specifically, it aimed to identify the messages that health care providers derived from watching the movie and to make recommendations on how this and subsequent films could serve as an effective tool for AIDS education. 134 health care personnel representing 13 regional hospitals from all over the country watched the film, then answered a questionnaire. This entry was posted in Filmography and tagged Christopher de Leon, Dahil Mahal Kita: The Dolzura Cortez Story (1993), Filmography: Dahil Mahal Kita: The Dolzura Cortez Story (1993), FILMS, HIV/AIDS, Laurice Guillen. Bookmark the permalink.